Oh, high school prom. How incredibly gauche. While some may look back fondly on that awkward time in our life, we were just too cool for the whole ordeal. Come on, no alcohol? Acne? A wannabe DJ playing Sean Paul over and over again? We wish we could have a do-over. Apparently, so did Coach. In honor of their new flagship store opening in Paris, the iconic American brand brought the adolescent shindig to France, kicking off Paris Fashion Week with the ultimate bash. Of course, this was no high school gymnasium. 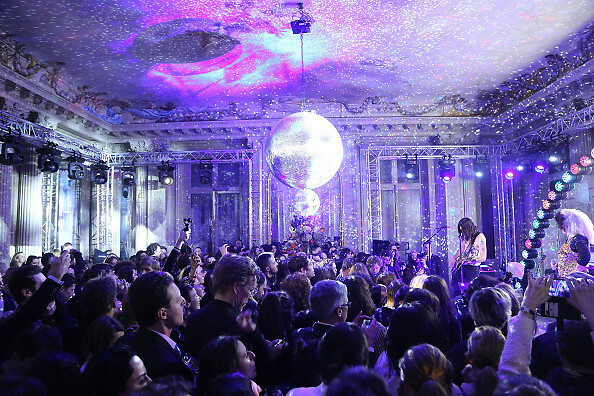 A giant disco ball, hordes of It Girls, and a performance by Debbie Harry hosted at the chic Hôtel Salomon de Rothschild mansion made sure this prom was fashionista-approved. Who was there: Guests included Debbie Harry, Devon Windsor, Alexander De Betak, Sofia Sanchez de Betak, Stuart Vevers, Ronnie Madra, Suki Waterhouse, Toni Garrn, Mark Ronson, Aymeline Valade, Emmy Rappe, Monika Jagaciak, Riley Keough, Tom Van Dorpe, Alma Jodorowsky, Chloe Grace Moretz, Teddy Quinlivan, Catherine Baba, Edie Campbell, Hana Jirickova, Matilda Dods, Miguel Enamorado, Emmanuelle Alt, Maria Buccellati, and Stefano Tonchi.